The HP LaserJet 53X Black Print Cartridge, with an average yield of 13,000 pages, offers great print quality and reliable performance for fast, professional quality printing. Easy to install and replace, original HP toner cartridges ensure output consistency over the life of the cartridge and make supplies easy to maintain by providing status monitoring and proactive alerts when replacement is needed. Designed together with your HP printer, these supplies ensure crisp, sharp, vibrant results every time. Advanced toner formulation and particle design ensures crisp, sharp output every time across a broad range of color documents. Cartridge architecture and features make supplies easy to order, install, manage, and maintain. Engineered to deliver consistently great results every time, enabling professional quality results in-house. This cartridge's average yield is 13,000 pages. 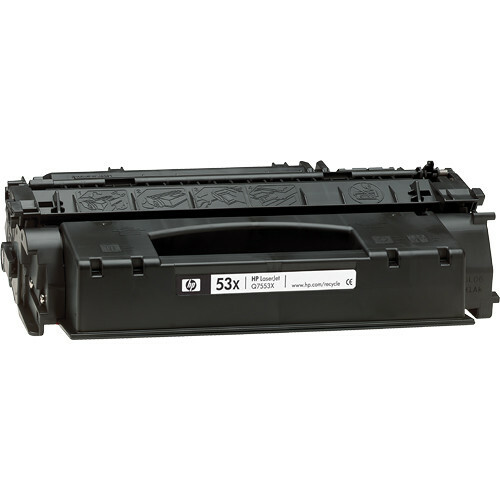 Box Dimensions (LxWxH) 15.8 x 8.55 x 4.7"
LaserJet 53X Black Print Cartridge is rated 4.8 out of 5 by 8. Rated 5 out of 5 by DRKNES from THX! DRIVERS JUST CAN'T SEEM TO GET IT RIGHT WHEN IT COMES TO ST. OR TERR. Rated 3 out of 5 by BrendaW from My HP toner cartridge Hello. There's not much to say really. I have a laser printer that I LOVE and is super-duper dependable. I ordered another toner cartridge as I know my current one is running low. That's it! Thanks for the good service and speedy shipping!! Rated 5 out of 5 by Bgreen7929 from Perfect Performs just as one could expect. Perfect every time. No messy outcomes, everything works as it should and I get it the next day, free. Can not beat that! Rated 5 out of 5 by Anonymous from Great Service I have an old HP workhorse printer. This cartridge was exactly what I needed. B&H had the product and delivered it as promised! Rated 5 out of 5 by Anonymous from Excellent Product Exact product that I would have purchased from the office supply store, but $ 20 less. Thank you B&H!! Rated 5 out of 5 by Program Assistant from Will be buying again .... After searching through the internet for this product, B&H was the best priced and reliable. Rated 5 out of 5 by Anonymous from Genuine HP cartridge at better price This is high capacity refill at good discount from list price. Rated 5 out of 5 by The Computer Guy from Works Like It Should Works perfectly.